22nd September, Ashgabat: 2015 World Championships Trios gold medallist and top seed, Baek Sung Ja of Korea won the Women's Singles gold medal on the second day of the 5th Asian Indoor & Martial Arts Games. Baek, who topped the earlier 6-games preliminaries to qualify for the quarter-finals, trashed eighth-seed, Alisha Nabila Larasati of Indonesia, 258-157 to advance to the semi-finals. The Korean was nearly eliminated in the semi-final match against seventh-seed, Zhang Yuhong of China but got a lucky break when Zhang suffered a split in her final frame to hand the match to Baek, 204-213. In the title match against fourth-seed and 29th SEA Games Doubles gold medallist, Tannya Roumimper of Indonesia, the 26-year-old Baek spared her first frame before knocking down two consecutive strikes in the second and third frames to open up a gap of 11 pins. Roumimper struck in her opening frame and spared her next two frames. Both had two additional spares in the fourth and fifth frames but the Korean struck twice again to extend her lead to 39 pins when her opponent missed a single pin spare in the sixth frame and failed to convert a three-pin spare in the seventh frame. Despite suffering a split in the eighth frame, Beak recovered with a double in the ninth and tenth frames and ending the match with a spare in the bonus frame to win comfortably, 210-161 for the gold medal. Roumimper, who took home the silver medal, had breezed past sixth-seed, Natthida Sertluecha of Thailand, 257-174 in the semi-final before losing the final match to the Korean. Natthida defeated third-seed, Jung Da Wun of Korea, 247-218 to advance to the semi while Zhang beat second-seed, Angkana Netrviseth of Thailand, 205-182 to make the semi. The champion got off to a great start with the first perfect game of the competition during the preliminaries and never looked back, crusing home to a comfortable win with 1455. Netrviseth finished second with 1333, 122 pins adrift. Jung and Roumimper finished third and fourth position with 1330 and 1318 while Liza Del Rosario of Philippines, Natthida, Zhang and Alisha qualified for the quarter-finals in fourth to eighth positions. 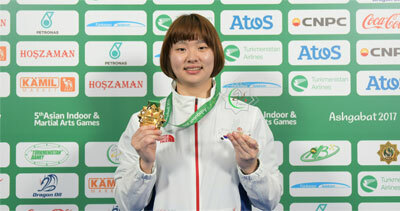 China's Peng Rui missed the cut by eight pins in ninth position with 1256. Competition will shift to the Doubles event tomorrow starting with the men's division, divided into two squads. The top 8 pairs from the combined squads will qualify for the quarter-finals shootout. The winners in the quarter-finals will proceed to the semi-finals. Winners of the semi-finals will meet in the gold medal final match. The Women's Doubles event will be contested on September 24. The Team of Four, to be bowled over two blocks of three games each will be staged on September 25. The top 4 teams will advance to the semi-final shootout on September 26 and final match on September 27.